Multifunction, made of steel, with long lifetime. 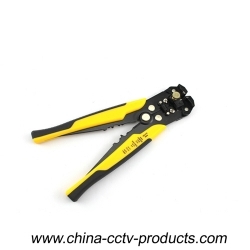 For cutting and stripping and crimping wire and cable. Crimping insulated and non-insulated terminals. Adjusting the swivel knob to strip electrical wire gauge up to 24 AWG(0.2mm^2). Adjust the screw to “-“ symbol, for thinner wires, “+” symbol, for thicker wires. The strippers will not damage the metal part of the electrical wire.